This year in Formula 1 we’re again talking about Ferrari as the leader of world racing, and so it’s only natural to think of the man who started this “miracle” of automobile engineering: Enzo Ferrari, the founder of what is today considered one of the most famous brands in the world. What follows is the story of the great man’s life. Enzo Ferrari was born during an icy morning on February 18, 1898 in the outskirts of Modena. His parents, both from nearby Carpi, were modest people who lived above the metal workshop where Enzo’s father built bridges and shelters for the railways. Enzo had a happy childhood and he shared his room with his older brother Alberto, known as Dino, who was a great lover of books and literature. The sudden death of the Ferraris’ father from pneumonia in 1916 shocked the family. In that same year, Enzo’s brother Dino lost his life to a serious infection contracted during his military service. From that point on, Enzo learnt how to get by on his own and how to deal with solitude. As a boy his favourite sport was track and field athletics, then he moved on to shooting and he also developed an aptitude for fencing and skating. In 1917, Ferrari departed for the military and was assigned to the third artillery brigade of Mantua. It was here that he began to bring to life his greatest passion: cars. Unfortunately, his stay in Mantua was very brief as he contracted the same infection as his brother. However, after two operations, he managed to recover and was able to look for work. During the winter of 1918, Ferrari decided to go to Turin to find his fortune and it was only thanks to his dedication that he managed to get a modest job in a factory where light trucks were turned into chassis for cars. It was Ferrari’s job to test-drive the vehicles and deliver them to the body shop known as Italo-Argentina di Milano. It was actually in the Lombard capital that he met Ugo Sivocci, a man who worked at Costruzioni Meccaniche Nazionali and soon enough the two became inseparable friends. Ferrari went on to work at C.M.N. and became the test driver there, yet he would later leave this job to take a position at Alfa Romeo in 1919. In the same year, he started car racing at the first Parma-Poggio di Berceto hillclimb race and ranked fourth in the three-litre category. A few months later, in 1920, he took part in the Targa Florio and Sivocci accompanied him. The two reached Naples with the same cars they’d raced in, after an adventurous journey braving the snow in Abruzzo. Yet all of Ferrari’s struggles were worth it, as he came second in another race and won 12,000 lire, the equivalent of €12,000 in today’s money. Halfway through November, he claimed his first victory in the Macchine di Serie category, dominating the stretch in the course known as the “Flying Kilometre of Gallarate”. Ferrari’s relationship with Alfa Romeo was bearing more and more fruits, yet his life took another sad turn when, during the trials of the Great Prize of Monza, Sivocci went off the track and lost his life. Alfa Romeo’s only racing win in 1923 took place in Ravenna. Among the eminent figures at the event were the parents of Francesco Baracca, an ace fighter pilot in World War I. Baracca’s mother, the Countess Paolina Biancoli, was struck by the courage and nerve of a young racer at the event, Enzo Ferrari. The noblewoman gave him the symbol that her legendary aviator son displayed on the cockpit of his aeroplane. “Ferrari,” she said, “put my son’s prancing horse on your cars. It will bring you luck.” Like a true Modenese, Ferrari added the canary yellow to the background of the emblem (canary yellow is Modena’s official colour). The crest would appear on the bonnet of the Alfa Romeo included in his team of racing cars. Ferrari began this practice at the Total 24 Hours of Spa racing event on July 9, 1932, in order to distinguish his cars from the official ones that flaunted the four-leaf clover. It wasn’t long before the first of the great drivers joined the Ferrari racing team, including Tazio Nuvolari and Achille Varzi. At the end of 1943, after an astounding split with Alfa Romeo, Ferrari made a return to Modena and arrived at the town of Maranello. He set up a new company there, and so began the story of Ferrari as a car manufacturer. The success of the company was aided by the fact that, using a Ferrari car, José Froilán Gonzáles won the GP of Great Britain by beating Alfa Romeo for the first time. In the 1950s, Ferrari began to build Gran Turismo cars and these were perfected aesthetically by ingenious stylists: Giovan Battista Farina, then his son Pininfarina. Nineteen fifty-six was a horrible year for Ferrari, as he lost his son Dino, who was a source of stability in his life. The following year wasn’t any better: the Mille Miglia race finished with the deaths of two drivers and nine spectators. Enzo Ferrari was accused of installing faulty tyres in his cars, but after the trial, he was cleared of this charge. This was a very hard blow for him that dragged him down for many years until 1977, when he resigned from the company he had created and retired to private life in his beloved Modena. 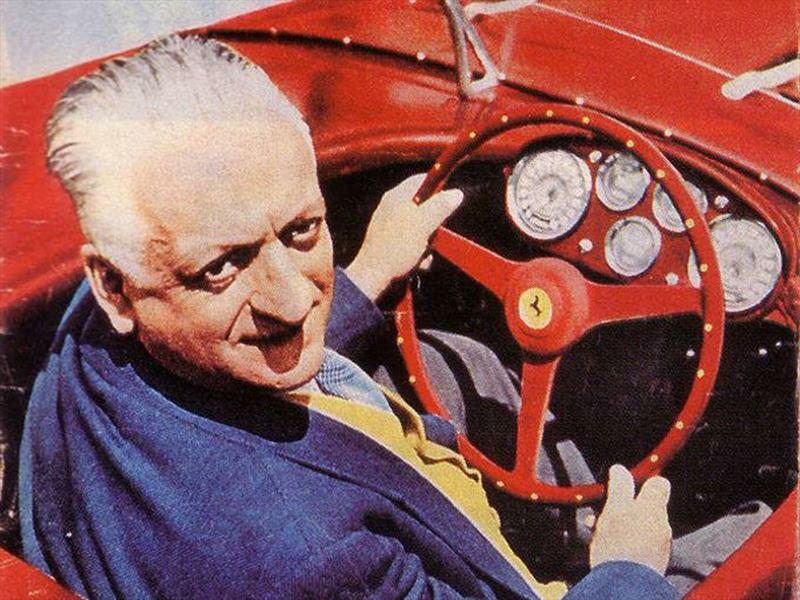 Enzo Ferrari died on August 14, 1988. As little as a month later, at the Grand Prix of Monza, Ferrari racers Gerhard Berger and Michele Alboreto earned first and second place and dedicated their victory to the great “Drake”, the affectionate nickname ascribed to him by the English. And since then, the legend of Ferrari has continued on racing tracks all around the world.